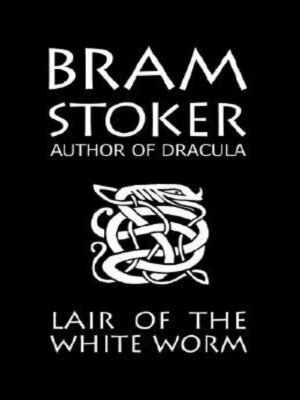 The Lair of the White Worm (also known as The Garden of Evil) is a horror novel by Irish author Bram Stoker. The plot focuses on Adam Salton, originally from Australia, who is contacted by his great-uncle, Richard Salton, in 1860 Derbyshire for the purpose of establishing a relationship between these last two members of the family. His great-uncle wants to make Adam his heir. Adam travels to Richard Salton's house in Mercia, Lesser Hill, and quickly finds himself at the centre of mysterious and inexplicable occurrences. The new heir to the Caswall estate, known as Castra Regis, the Royal Camp, Edgar Caswall, appears to be making some sort of a mesmeric assault on a local girl, Lilla Watford, while a local lady, Arabella March, seems to be running a game of her own, perhaps angling to become Mrs. Caswall. Adam Salton discovers black snakes on the property and buys a mongoose to hunt them down. He then discovers a child who has been bitten on the neck. The child barely survives. He learns that another child was killed earlier while animals were also killed in the region. The mongoose attacks Arabella who shoots it to death. Arabella tears another mongoose apart with her hands. Arabella then murders Oolanga, the African servant, by dragging him down into a pit or hole. Adam witnesses the murder which he cannot prove. Adam then suspects Arabella of the other crimes.